Artist’s impression of Planet Nine as an ice giant eclipsing the central Milky Way, with a star-like Sun in the distance. Neptune’s orbit is shown as a small ellipse around the Sun. The sky view and appearance are based on the conjectures of its co-proposer, Mike Brown. Credit: Tom Ruen with background from the Milky Way, an ESO image. Planet Nine, the massive orb proposed to explain the clustered orbits of a half dozen remote Kuiper Belt asteroids, may have a darker side. Periodic mass extinctions on Earth, as indicated in the global fossil record, could be linked to the hypothetical planet according to research published by Daniel Whitmire, a retired professor of astrophysics and faculty member of the University of Arkansas Department of Mathematical Sciences. Artist’s impression of a collision between Earth and and a comet or asteroid a few kilometers in diameter would release as much energy as several million nuclear weapons detonating and set off a mass extinction event. Planet Nine is estimated to be 10 times more massive than Earth and currently orbiting about 1,000 times farther away from the Sun. Astronomers have been searching for a potential large planet — for years called “Planet X” — that might be implicated in a handful of major mass extinctions over the past 500 million years. During those times, between 50 and more than 90% of species on Earth perished in a geological heartbeat. The worst, dubbed the Permian-Triassic event or the Great Dying, occurred 250 million years ago and saw the disappearance of more than 90% of the planet’s life in a geological heartbeat. Whitmire and his colleague, John Matese, first published research on the connection between Planet X and mass extinctions in the journal Nature in 1985 while working as astrophysicists at the University of Louisiana at Lafayette. They proposed that perturbations from a 10th planet (Pluto was considered a planet back then) could fling a shower of comets from the Kuiper Belt beyond Neptune in Earth’s direction every 28 million years in sync with recorded mass extinctions. 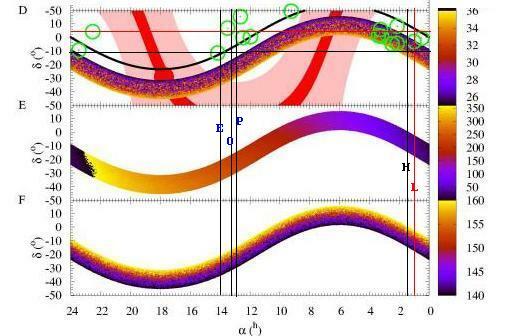 Two other ideas also proposed at the time they wrote their paper — a sister star to the Sun and vertical oscillations of the Sun as it orbits the galaxy — have since been ruled out because the timing is inconsistent with the extinction record. Only Planet X remained as a viable theory, and it’s now gaining renewed attention. Whitmire and Matese proposed that as Planet X orbits the Sun, its tilted orbit slowly rotates, causing the location of its perihelion (closest point to the Sun) to slowly precess or shift position along its orbit instead of remaining in the same place. Every planet precesses, so no surprises here. But location can make a huge difference. 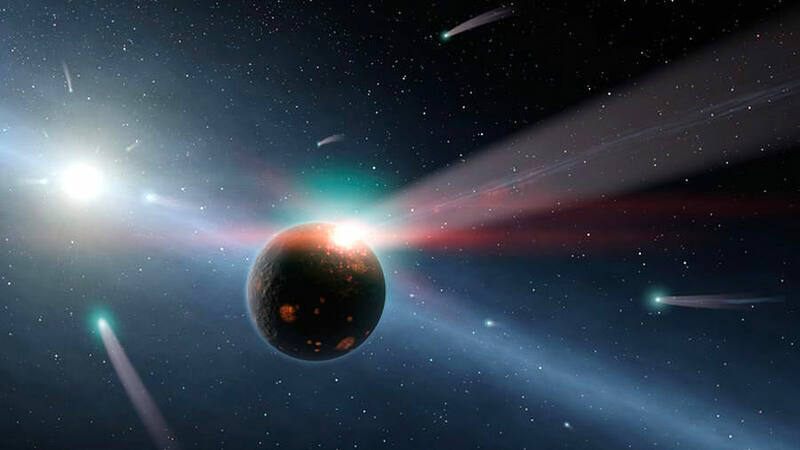 The team proposed that Planet X’s slow orbital gyration directs it into the Kuiper Belt approximately every 27 million years, knocking comets into the inner Solar System. The dislodged comets not only smash into the Earth, they also vaporize and break apart in the inner Solar System as they get nearer to the Sun, reducing the amount of sunlight that reaches the Earth. Add it up, and you have a recipe for cyclic destruction. One thing to keep in mind is that their research led them to conclude that Planet X was only 5 times as massive as Earth and 100 times farther from the Sun. This doesn’t jive with the size and mass particulars for Planet Nine inferred by researchers Konstantin Batygin and Michael E. Brown at Caltech earlier this year, but until someone tracks the real planet down, there’s room for argument. Comet and asteroid showers are often cited as possible bad guys in extinction episodes. And why not? We have hard evidence of the asteroid impact that sealed the dinosaurs’s fate 65 million years ago and have seen some six impacts at Jupiter since 1994. It’s cosmic billiards out there folks, and the game’s not over. There is no need to ascribe dark matter, ninth planets or other reasons for causing mass extinctions because the Gravity Theory of Mass Extinctions has solved this issue. This theory posits that under unusual circumstances, when mass on the Earth’s surface, e.g., Pangea, moves to higher latitudes the Earth’s core elements will move off-center changing surface gravity. When that mass moves to lower latitudes surface gravity increases causing extinctions. Pangea moved to lower latitudes during every major mass extinction in the Permian, Triassic, Cretaceous and prior to that Gondwana and Laurasia also did the same. This latitudinal movement has been documented in a research paper entitled ‘Plate tectonics may control geomagnetic reversal frequency’ 10/11/2011. If you really are advocating this as a scientist, then you should be welcoming the scrutiny. You should be encouraging people to challenge the hypothesis. That’s how true science works. Once nobody can find any flaw in the hypothesis, that’s when you can say it’s been proven. And even then when new research comes to light, the hypothesis may be challenged again. Well, Planet IX might be the new research which challenges GTME. So, you should be accepting the challenge. First off we do not know if the orbit of Planet X is close enough to fling around Kuiper Belt objects. Sounds a bit doomsday conspiracy theorizing to tag mass extinctions to this planet. Our ancestors have been around for 3 million years. So even if this Nibiru extinction event is true we got a whale of time @27Ma, when the planet will break all hell loose in the solar system. The Kuiper belt ends rather quickly. Too quick to be a natural process of star formation. So that leaves a planet that’s big enough to clear everything out of it’s orbit. That is quite a bit of proof that a Planet 9 exists. Because of it’s distance from the Sun, it’s probably an Icy Rock. Because no planets orbit near it, it never had to compete for material. Thus, it’s good to assume it’s a very massive icy rock. And it’s presence is still exerting force on the outer edges of the Kuiper Belt which can be measured with telescopes. More proof. I’m not claiming that asteroids being flung around by this Planet caused extinctions, but 100% this planet has caused asteroids to be flung around in the past as it was clearing out it’s orbital path. And because of the effects currently on the Kuiper Belt, it’s probably is not done. After Earth is a fictional future scenario by Thomas Blueprint. In the year 2036, an asteroid with the land mass of 10.6 million sq feet and 1,700 kilometers in diameter, roughly the size of a Continent collided with the moon. The moon was destroyed. The lunar dust rained down on the earth for years, blocking out the sun and contaminating the oceans. The earth is now uninhabitable and squalid. The richest and smartest people on the planet knew about the asteroid 20 years in advance. They built a space station the size of the moon to live on. Three other space stations were built too. The Russians found out the elites’ secret about the asteroid and built a space station on the Moon Europa, orbiting Jupiter. The elite’s military lived on a barrack on the red planet Mars. The last space station housed the humans and robots known as e-humans, located at the edge of the solar system. Please, Mr King, refrain from calling it “Planet 9” as we have a 9th Planet and that is Pluto! Planet X would be better, much better in fact. Indeed. In fact, if Planet 9 (Pluto) hasn’t cleared it’s orbit (they say), making it not-a-planet, then it would appear Planet X hasn’t either – making it not-a-planet either. Either they both are, or neither are. You can’t have one rule for one and one for another. Unless you want to try saying that an object that’s 10 times more massive than Earth is a “dwarf planet”. Really wish people would just give up whining about Pluto. For one, It’s Pluto/Charon as it’s a binary system. Lastly, the classification is just that, a classification. I doubt Ceres is insulted at being a dwarf planet rather than a full-fledged one. Pluto/Charon gets to enjoy the seat as the only binary planetary system we know of, so even as a dwarf it remains more than special. Also no understanding regarding the current definition for the qualifications of a planet. Clearing its orbit does not mean that it’s the -only- thing in it. If that were true then none of the planets would be planets as there’s junk in every single orbit. Clearing its orbit means that the object in question comprises the vast majority of the mass that exists in its orbit. An ice giant 10x the mass of Earth would by far ‘outweigh’ the bits of the Kuiper belt that it might cross into. THX Bob. I went over to Citizen Science Alliance and looked over the suggested projects. Saw Planet Hunters but they’re mission is to scan the Kepler database. I wonder… if there is a citizen scientist prog. you know of set up to use participants spare CPU time, like SETI online did, to crunch data in the search for Planet X? Planet X, very retro. They’ll be finding canals on Mars next. Can we just breathe by the nose and wait until that «Planet 9» is really discovered? I understand the logic of it but let’s find it first before making any accusation. We don’t need Planet 9 for dinosaurs extinction. Sorry for mistake,..my last sentence in previous reply should be Nemesis in aphelia or perihelia,..in such case Nibiru goes closer to planets. Again to extinction. There were many documents, articles about extinction 65 millions years ago, but somehow nobody wants seriously research extinction on the end of last glaciation cca 9500B.C. There were two global changes (Vostok, GISP2 ice core drilling results) within 1500years (could be 2 arrivals of P9 to perihelia approx. 11000B.C., 9500B.C.) during Nemesis aphelia,.. Ice was on England, till south Poland border,..but West Siberia was nearly subtropical (mammoths sudenly frozen on cca -70C had savanna sort of food in their stomachs). So north pole was probably 15-20deg. southern in Canada,.. What was able to do such global changes? Halley comet, it’s main axis points in these centuries also to suspected area for X,..where are some from those 6 objects with very prolongated orbits too,.. Previous PostPrevious Do We Live in a Special Part of the Universe?